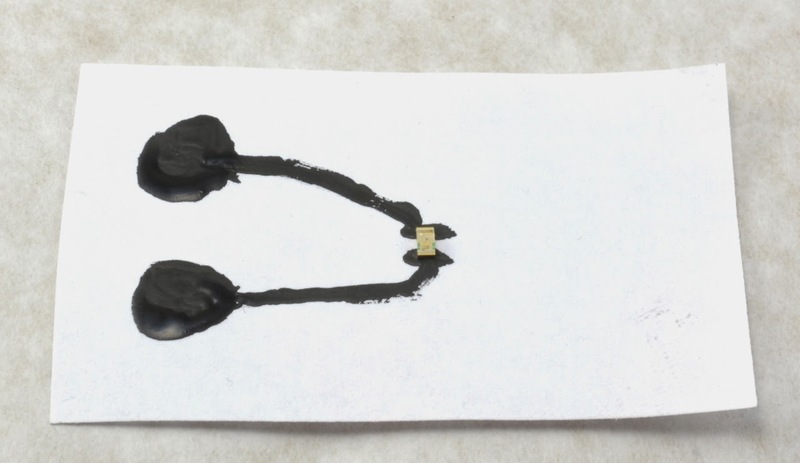 I have been experimenting with some Bare Conductive Paint that I bought from CPC after seeing it being used in screen printing at Lancaster's Highwire Lab. 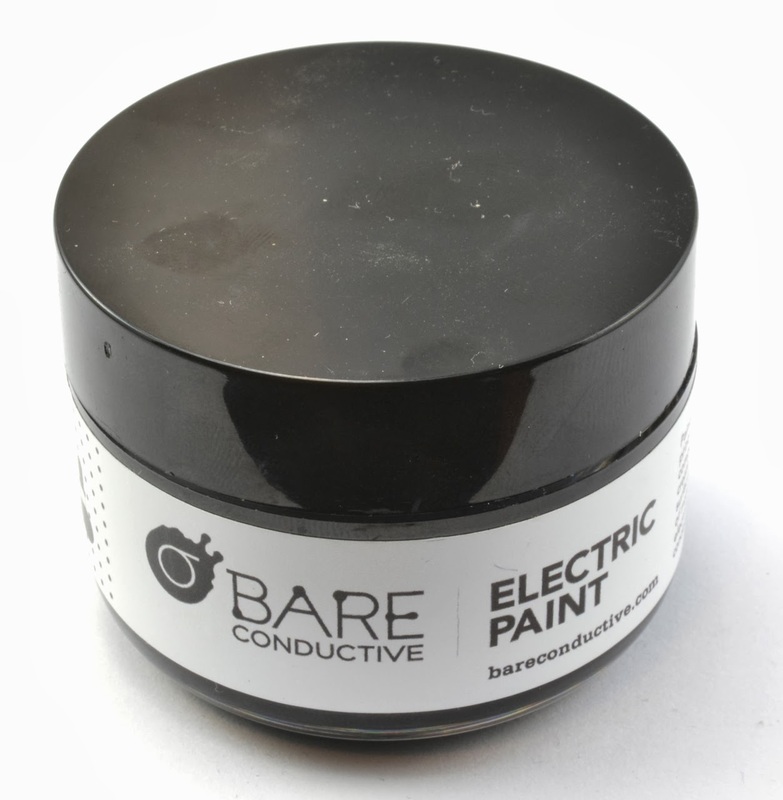 The paint is made by Bare Conductive in the UK. The thirst thing I wanted to know was just how conductive is this stuff. So I cut myself a stencil with tracks of 1mm (40 mils) and 3mm (120 mils) and daubed paint onto the paper below. It leaked a bit. I am really no good at art. However, the final tracks are good enough for a rough test. Being somewhat impatient, I first tried measuring the resistance before the tracks were properly dry. The resistance was actually several hundred kΩ but falling as I watched. There is clearly a very high resistance until the paint is properly dry, which took perhaps 30 mins. 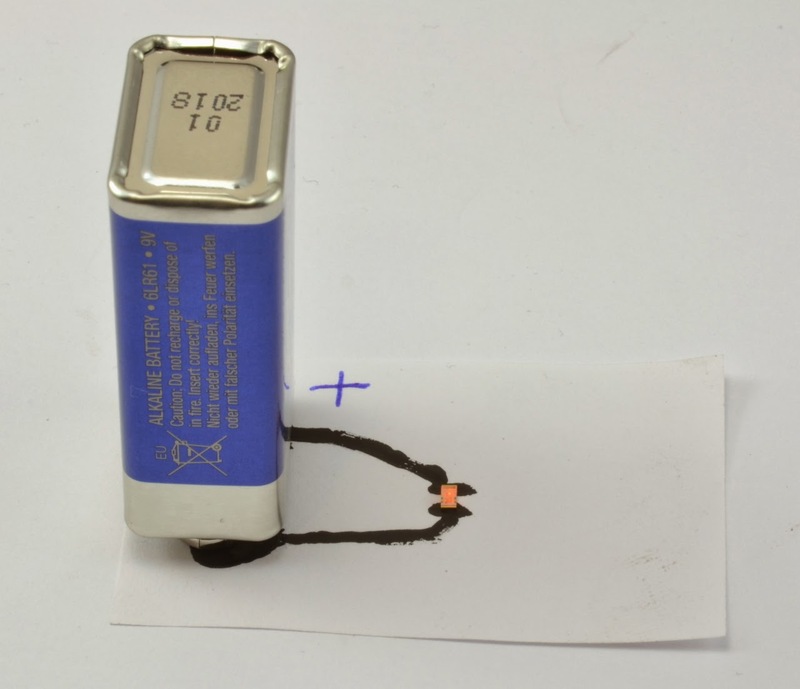 So, its not quite like painting with wire at all, but that's not necessarily a bad thing as it means that you could very easily paint yourself some resistors. If you are using LEDs then just the tracks are going to provide more than enough current limiting resistance. My next experiment was to see how well a surface mount 1206 LED would stick to the paint. So, I painted the arrangement shown below and popped the surface mount LED onto the wet paint with a pair of tweezers. It actually sticks really well and shows no sign of falling off even when the paper is shaken vigorously and even curled up. 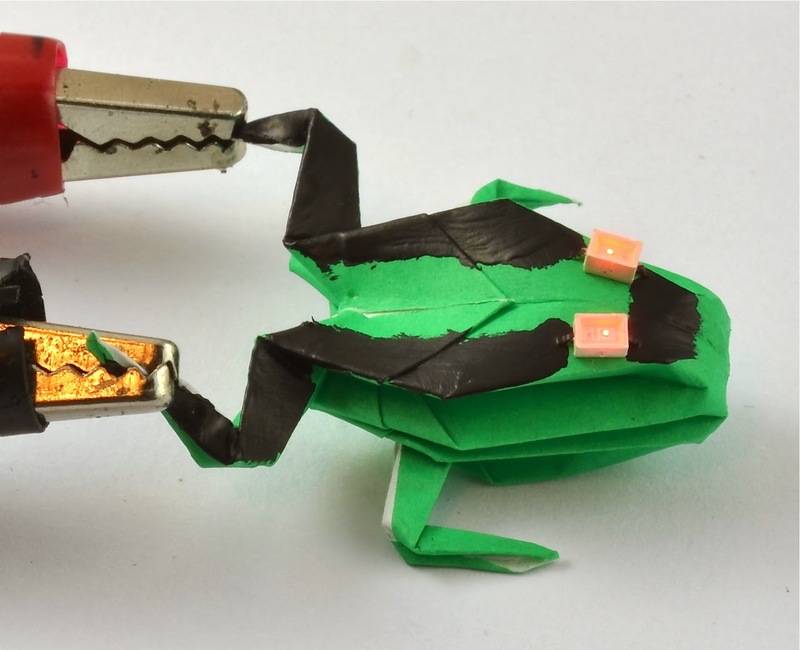 So the next step is to make an Origami frog and put a pair of SMT LEDs in series on its head to make it look demonic. 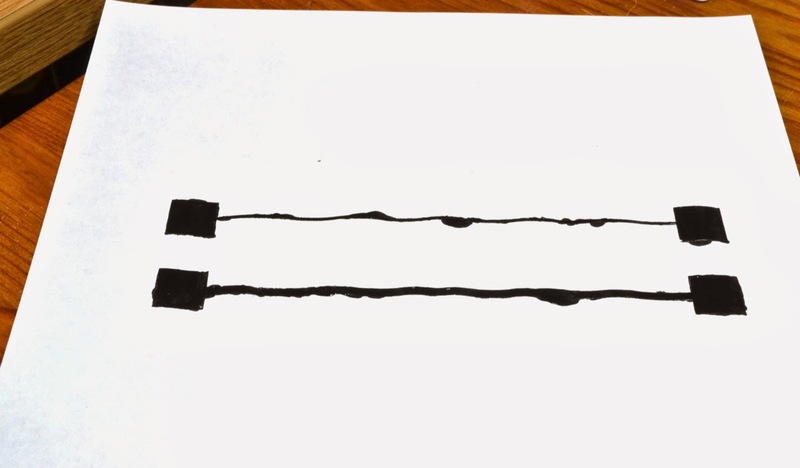 The connections are made by painting back towards the frog's legs, where croc clips connected to a battery could be attached. This paint is an excellent product and very easy to paint with. I will be trying out some proper stencilling with PCB layout's from EAGLE. It will be fun planning things out to account for the high resistance of the wire. I also think there is probably some fun to be had with pre-painted Origami. Could this paint be used for the repair of car rear heated screens, or perhaps the resistance is too high ? I think the resistance is too high, also it is water soluble, so condensation would be a problem. I like the idea of making PCBs without the need for an acid bath.